“Portrait of George IV of England.” Painted by Thomas Lawrence in 1816. When you think of England's Regency era, a few things probably come to mind. Extravagance, high fashion, romance, and exoticism: any of these words can sum up the national mood and aesthetics of this era. For those unfamiliar with this period in history, the Regency era gets its name from George IV, who was chosen to be Regent after his ailing father, King George III, was declared unfit for rule. The Prince ruled as Regent from the years 1811 through 1820, when his father passed away and he was named King George IV. As Prince Regent, George IV was a patron of the arts, and had a major influence on the interior design style, fashions, and architecture of the day. The Royal Pavilion in Brighton was built to be his personal retreat and directly reflected the Prince's tastes as well as the changing world around him. Regency style is an extension of Neoclassical style from the 1700s, so columns and domes continued to be popular architectural features. Furniture makers of the 1800's also copied Greek and Roman furniture styles even more closely than Neoclassical designers had. Some of the ideas they borrowed included chairs with animal legs, couches with scrolled ends, and decorative lions and griffins. This Regency-style convex mirror is sold by English Georgian America and features two gilded serpents. Click here for more information. Another Regency reproduction by English Georgian America, this mahogany chest of drawers has both lion mask drop handles and lion’s paw feet. Available from their website. Napoleon's campaign against the English in Egypt created renewed interest in Egyptian art among Europeans. Motifs taken from ancient Egyptian artifacts were incorporated into both the English Regency style and the French Empire style. The most popular motifs were crocodiles, birds of prey, and sun discs. Where Neoclassical and Regency style differed was that Regency incorporated more visual ideas from Asia. The British East India Company, established in the 16th century, continued to import goods from China, Southeast Asia and India in the 1800s. Chinoiserie, which we covered in a previous blog, became even more popular in the Regency period. An illustration of the the banqueting room at the Royal Pavilion in Brighton. This drawing is from John Nash's ''Views of the Royal Pavilion'' (1826). Images of Chinese domestic scenes line the walls. Before the Prince Regent's time, Chinoiserie style was usually reserved for bedrooms and tea pavilions. But that didn't stop George IV from filling his Royal Pavilion with Asian wallpaper, decorative dragons, paintings of Chinese domestic scenes, imitation bamboo, and lacquered furniture. Meanwhile, the exterior of the Royal Pavilion featured domes and minarets based on Indian architecture. At the time, many visitors found the Royal Pavilion's extravagant Asian decor shocking. Decorating a home in Regency style today might seem intimidating. However, it can be done if you shop with the right kind of furnishings in mind. For those who don't collect antiques, there are many fine reproduction pieces available. Regency furniture was usually made of woods such as rosewood, zebrawood, or mahogany, and finished with beautiful veneers. Brass inlays became a popular feature, as did ormolu, or imitation gold. Pieces that were less expensive were often repainted in black lacquer. While English Regency furniture is not as curvaceous as French Regency furniture from the 1700s, English designers did incorporate some curves, especially in the legs of furniture. Above, left: This stunning breakfast table by English Georgian America has an intricate, geometrically inlaid tilt top. Go to their website for a closer view. Above, right: Black painted furniture is commonly seen in Regency style rooms. This Regency style dresser is also available in white from English Georgian America. Neoclassical tended to have understated color schemes, but Regency style was more flamboyant. This is not a style for someone who doesn't love color. The Royal Pavilion was heavily decorated in reds, pinks, greens, and gold. If you don't want to work with multiple bright colors in a room, pick just one and design the room around that color. For example, you could complement a pair of blue-and-white china pieces with cobalt blue drapes in the same room. The blue silk pillow on this double chairback settee can add a touch of color to a space. This is another piece available at English Georgian America’s website. Many Regency homes will have a bold accent wall with an exotic Chinoiserie pattern. Another option is the stately "Regency stripe" pattern, which alternates between light and dark stripes of the same width. 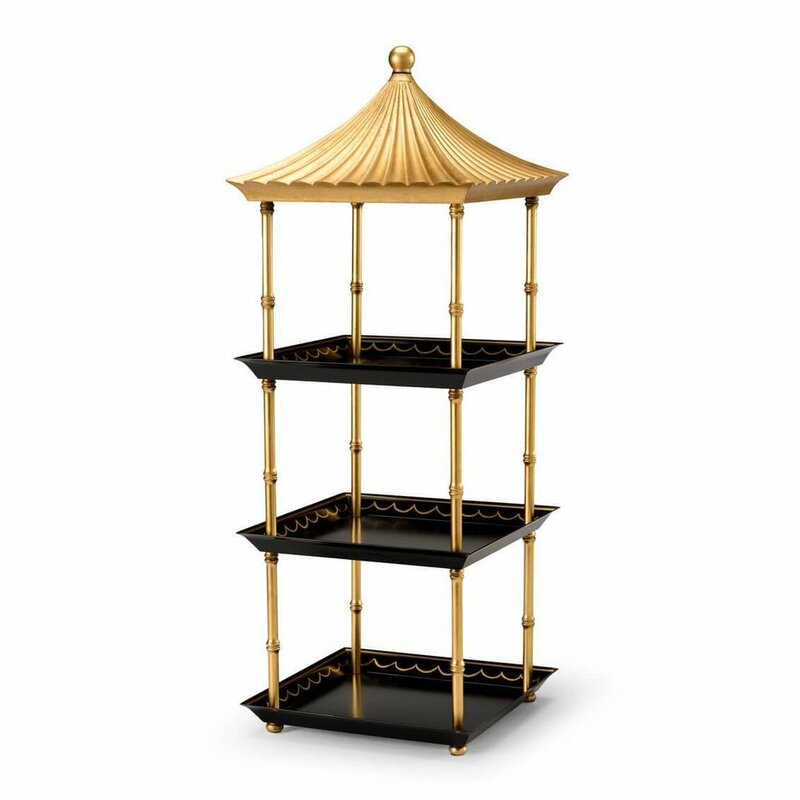 An etagere resembling a Pagoda, such as this piece by English Georgian America, would have fit right in with the Brighton Pavilion’s Asian aesthetic. Currently in-stock at their website. Accessories are another area where you can add a multicultural touch. In a Regency style room, it's not unusual to see foo dog statues, or Roman busts, paired with European style furnishings. Finally, make sure to have an eye-catching chandelier in any room that needs it. The more unique and spectacular the design is, the better. When you set out to recreate Regency style in the modern day, there is no need to turn your Dallas home into an opulent English palace. Instead, study the color palettes and furnishing choices you see in modern and classic Regency interiors. By drawing inspiration from what you see in photos, you can rework Regency style into a comfortable environment for yourself or your family. If you're still stumped on how to combine the many different features of this style, seeking out an experienced interior designer should be your next step. --Chambers Interiors & Associates Inc. When it comes to interior design, the best value for your time and money is hiring an ASID certified designer for your project. I am not only a member of ASID (American Society of Interior Designers), but I am also also a Registered Interior Designer (RID). This means that I maintain a strict standard of ethics and professional conduct which brings five major advantages to you as a customer. Registered Interior Designers like myself have the training and expertise to plan, schedule, execute, and manage your project from start to finish. We know and work closely with many vendors, contractors, architects, and artisans. The ASID’s industry partners include more than 2,500 different companies. 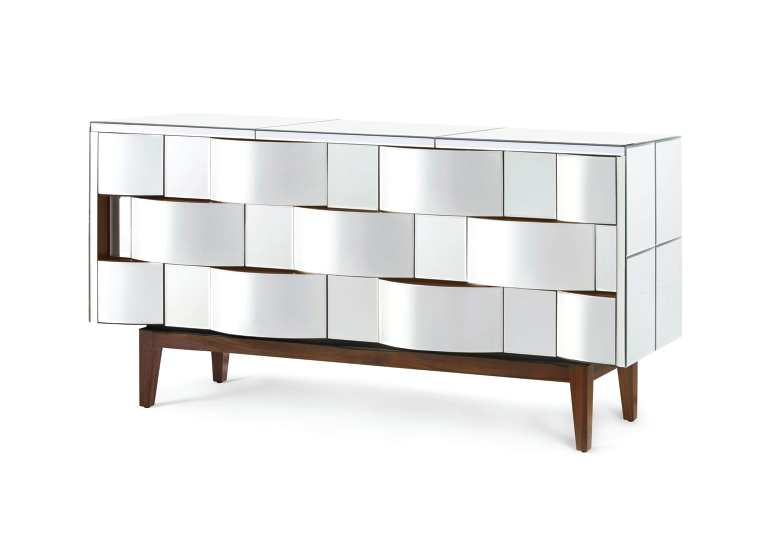 In addition to our knowledge of products, materials, and finishes, designers know exactly where to procure the furniture, accessories, and art for our design team. Some of the services and products we can purchase are not accessible to the general public. Another advantage to working with Registered Interior Designers is our knowledge of public safety. For example, if you have fallen in love with a particular fabric, I would make sure that the material meets fire code and durability standards. An RID will also know how to properly plan a house for someone who is handicapped. For example, for a homeowner using a wheelchair, handlebars may need to be installed in the shower walls. Interior designers will check and make sure that the architect has included these items in the overall plan. An interior designer’s education doesn’t end once they are admitted into the ASID. Once qualified, members must continue to take a minimum of 12 continuing education courses annually in order to maintain their membership. These classes include green sustainability, ethics, and accessibility. ASID designers work with green materials and can help point out green options for their clients. Examples of environmentally friendly materials include recycled bamboo flooring, or paint that doesn’t give off toxic fumes. One of my recent design projects was SMU’s Theta sorority house. I was personally recommended by the architect of the new building, and chosen out of seven designers. Without my certification, the Chambers Interiors team would not have been considered. Almost all commercial design projects are helmed by Registered Interior Designers. Our training and background are considered to be indispensable in this area. You may be interested to know that I have published blogs on a variety of design topics at the Chambers Interiors website. Some blogs cover historical design trends, such as Swedish style or Chinoiserie, and offer tips on how to recreate those styles authentically. Other blogs discuss general design advice, such as updating a home with antiques, or mixing wood tones. Reading a Registered Interior Designer’s blog can help potential clients get a sense of their expertise. Finally, an RID designer is knowledgeable about lighting, sound, and acoustics—all of which are especially important for office spaces, condominiums, and apartments. If you haven’t already hired an interior designer, take the advantage to hire an RID designer. You can feel confident that your project is in good hands and off to a fabulous start. Chinoiserie, a French word for "Chinese-esque," refers to European decorative art that was inspired by objects and stories brought back from the Middle East and Asia. It was most popular during the 1600s and 1700s, but there are many Dallas interior designers who are fans of this style to this day. Although Chinoiserie sounds like it should be primarily based on Chinese design, the style also owes its look to Indian, Persian, Korean, and Japanese art. Trade between Europe and Asia was open through the Silk Road beginning in the 1200s. Hand-painted porcelain, wallpaper, silks, and lacquered furniture were among the items brought back. In the year 1292, Italian merchant Marco Polo left China, where he had lived for 17 years, to return to Venice. Although Marco Polo was not the first westerner to travel to China, he was the first person to publish a manuscript about what he saw there: The Travels of Marco Polo. Europeans were astonished by what they read. For westerners, owning expensive fabrics and ceramics from Asia became a status symbol. The demand for Asian imports outstripped the existing supply, so European artisans learned to make their own imitations. These pieces were a mixture of actual Asian design features and pure European whimsy. One example would be pastoral scenes, which are typically a Rococo motif depicting European nobility; in Chinoiserie, the artist would illustrate the Chinese Emperor and court instead. Since Chinoiserie was in vogue during the same period that Rococo was, the two styles share some similarities: asymmetry, scroll forms, and fantastical imagery. The earliest examples of Chinoiserie were Italian, such as the silks produced by Lucca factories. Over time, different countries in Europe popularized different kinds of Chinoiserie. Germany specialized in porcelain figurines. The Netherlands are still famous today for their Delft pottery factories. Meanwhile, England produced silver, tapestries, and embroidery with Chinoiserie motifs. Chinoiserie's popularity reached its height in the mid 1700s, eventually giving way to neoclassicism's cool restraint. One hundred years later, the style made another comeback during the Rococo Revival. European nobility commissioned interior designers to create entire rooms for displaying their Chinoiserie porcelain and fabrics. There are many different images and motifs that characterize Chinoiserie. In patterns and painting, you will often see scenes of Chinese men with Fu-Manchu beards and long robes, and courtly Chinese women, in water gardens or pagoda pavilions. Landscape paintings were mountainous and misty, with bamboo, lotus flowers, and weeping willows in the foreground. The most popular animals in Chinoiserie art were a mixture of real and fantasy: fantastical birds, peacocks, elephants, foo dogs, and dragons of all colors. Chinoiserie is not all flowers and dragons, however. Geometric designs are important to this style too. Thomas Chippendale, an English cabinet maker, took inspiration from Chinese fretwork when he made his famous lattice-back Chippendale chairs. Furniture makers also incorporated pagoda shapes to their designs--for example, in headboards, bed canopies, chests, and secretaries. Though black lacquer and white porcelain are common in Chinoiserie interiors, this style can also be extremely colorful. Red, orange, teal, turquoise, pink, burnished gold, cobalt, and green can all be found in Chinoiserie interior design. Chinoiserie blends well with other styles because it brings a touch of worldliness and history into a room. Since this style is considered to have a feminine touch, and is maximal rather than minimal in detail, it's best to use it with restraint by using a few well-chosen Asian accessories. If you want to go bold, an accent wall with Chinoiserie wallpaper will transform the whole look of a room. Blue and white porcelain is beautiful in both traditional and contemporary interiors, so it's one of the easiest ways to add a little Chinoiserie. Since these ceramics share the same colors, you can mix and match different patterns without worry. While lacquer furniture is typical of Chinoiserie, not every furnishing in your room needs to be coated. Some pieces with Chinese fretwork will look best with their natural wood. Mixing natural wood and painted or lacquered furniture helps to create more visual variety in a themed Chinoiserie room. If you're going for a more subtle touch, focus on details and accessories rather than furniture. Examples include tableware with bamboo-styled handles; small lacquered boxes; ginger jars, or lamps shaped like ginger jars; figurines of Chinese characters or foo dogs; or decorative mirrors and chandeliers with pagoda shapes. Although over-the-top Chinoiserie rooms are not as popular today as they were in the 1700s, interior designers are still often asked about incorporating Chinoiserie in a room. If you need help tracking down the perfect antique pottery, wallpaper pattern, or Chippendale furniture to complement your contemporary or traditional space, Chambers Interiors - a Dallas-based interior design firm – can help you achieve the look. Today, you can inexpensively buy tea from China, India, Vietnam, or Africa even here in Dallas. But when tea was first brought to Britain in the 1600s, it was an incredibly expensive commodity. This is because the Dutch East India Company held a monopoly on the tea trade from China. Among those who could afford it, tea was popular for its taste, therapeutic quality, and the ceremonial way with which it was prepared. It's understandable that after paying a hefty price for these rare leaves, people would want to store them with special care. This is how the tea caddy came to be. The very first tea caddies only had one compartment, and were shaped like a bottle. The cap on top was removable and could also be used to measure out the tea. As for the caddies themselves, they were often made of silver, china, enamel, glass, or metal covered with straw-work. In the 18th century, the British government issued a tax on tea which made it even more costly to keep. Tea caddies from the 1700s had a lock, paper lining to protect the leaves from moisture, and two to three compartments. It was popular to offer guests either green or black tea, hence the separate compartments. Sometimes a glass bowl was set between them; historians believe this bowl was used to either mix the different teas or store sugar. Unlike the early bottle-shaped caddies, 18th century caddies were commonly made of wood, usually mahogany, walnut, or pine. Excavations at Pompeii and Herculaneum inspired designers to use more straight lines, concave and convex shapes, and motifs such as urns, flowers, and festoons. Designers became more creative with decorating the outside of the caddy as well. Painting, marquetry, and rarely, carving, were used to decorate the wood. More unusual materials for caddies during this time include ivory, tortoiseshell, and papier-mâché. As England was exposed to other cultures, tea caddy makers began to experiment with the traditional forms. Some tea caddies from the early 18th century have 'pagoda' shaped tops, or sides that slope upward and taper like the Egyptian pyramids. Another popular design from this period is like a sarcophagus, boxy with a rectangular lid. Many of these caddies also had metal or wooden feet. 19th century tea caddies have less marquetry, as the form of the tea caddy was intended to be striking on its own. The more detailed pieces incorporated brass inlay, floral designs, and penwork. If you search for tea caddies online, you will occasionally come across pear and apple-shaped single compartment tea caddies. Tea caddies like these were produced into the early 1800s. These command high prices because of their novelty, and reproductions are often passed off as the real thing. Tea became increasingly accessible in the 19th century after India entered the tea trade. Loose leaf tea was soon desired by all classes of people, and as demand rose there was pressure on the English government to reduce the tea tax. Naturally, storing tea carefully became less important. In the 1880s, pre-packed tea was finally available in grocery stores. This marks the end of tea caddy production. You can tell that a wooden caddy is authentically from the late 18th century if the wax or turpentine finish has built up a patina. Feeling along the edgings and inlays with your hand, you should notice some unevenness. Often these antiques have been refinished with a glossy polish, but many collectors feel that this ruins the piece. Today, the rarest kinds of tea caddies are ones made of ivory and tortoiseshell, or shaped like wine barrels and fruit. Silver is the most valuable material. If you're completely new to the world of antique collecting, you might find the prospect of tracking down the best antiques for the best prices daunting. Chambers Interiors has years of experience sourcing tea caddies for numerous clients and can provide you with the perfect piece to suit your tastes.